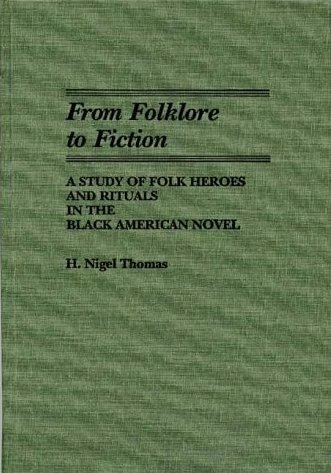 This study focuses on the transposition of Afro-American folk heroes and rituals from folklore to literature. Thomas shows how black American novelists perceive the heroes and rituals of their community, and the challenge these writers face in making oral forms serve the needs of their writing. The evolution of folklore in black fiction is clearly demonstrated. Works of writers from Charles Chesnutt and Paul Dunbar to recent ones such as Paule Marshall and Toni Morrison are analyzed to reveal both the writers’ ability to convert folklore into fiction and to dramatize the ontological value of the lore to Afro-American society. From Folklore to Fiction joins in the ever enlarging dialectic for studying and understanding the black American reality. The introduction to this book presents a review of scholarship on Afro-American folklore and fiction. The origins and functions of Afro-American folk forms are covered next. Major folk heroes are introduced, including the John Henry and black Moses, defiant heroes, and the trickster. The techniques and reasons for incorporating Afro-American rituals are the folk sermon, singing of spirituals, and ecstasy of the black church, the blues, the dozens, and jive.